Henry is remembered on the war memorial at St. Clement’s Church, Ipswich. Died: 11th April 1917; age: 26; KiA. Rank: Sergeant; Service Number: 7836. 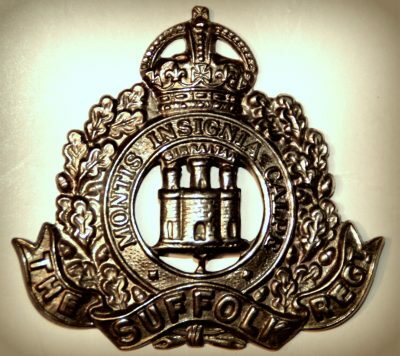 Regiment: Suffolk Regiment, 2nd Battalion, ‘H’ Coy. Relatives Notified & Address: Eldest son of Macaiah Hambling, of 7, Valley Road, Leiston, Suffolk; husband of Florence Alice Nellie Cattermole (formerly Hambling), of 3, Short Street, Ipswich. Henry was 5 months old and living with his parents & sister. Macaiah Hambling, 29, a General Labourer, born Orford, Suffolk. Emma Kate Hambling (nee Norman), 32, born West Dereham, Norfolk. Mildred Jane Hambling, 5, born Leiston. 1901 Cold Fair Green, Leiston, Suffolk. Henry was 10 years old and living with his parents & brothers. Macaiah, 40, a Fitter’s Labourer – Iron Works. Alfred Arthur Hambling, 8, born Leiston. Frederick William Hambling, 6, born Leiston. Ernest John Hambling, 3, born Leiston. Henry was 20 years old, a Soldier ranked Lance Corporal, for the 2nd Battalion of the Suffolk Regiment. Henry’s mother, Emma Kate Hambling died 1912, Leiston, Suffolk. In 1916, Leiston, Suffolk, Henry married Florence Alice Nellie Smith, born 1895, Ipswich. Soldiers’ Effects to Florence A. N. Cattermole – widow.